Putting an adjective like ‘incredible’ in a movie title is usually asking for trouble since it’s the perfect set-up for critics to take an easy potshot at it. I wish could say I was immune to such a tactic, but I will attempt to atone for my lack of creativity by at least offering multiple options for a replacement word. If you’re expecting a comedy classic, you will indeed be buying a ticket for “The Disappointing Burt Wonderstone.” However, if a pleasant comedy with plenty of chuckles and a few real laugh-out loud moments is what you’re hoping for, “The Perfectly Decent Burt Wonderstone” might be the film for you. Neither looks quite as snazzy on a marquee, do they? 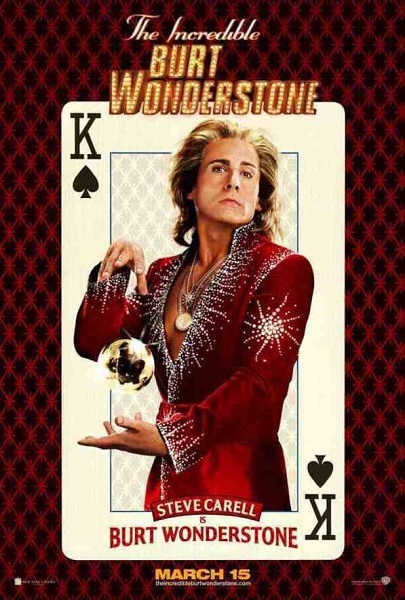 But before he’s disappointing or perfectly decent, Burt Wonderstone is a bullied, neglected boy who turns the magic kit he receives for his birthday into a way of life. His first illusions attract the admiration of fellow outcast Anton and their childhood friendship grows into a double-act headlining at a Vegas casino hotel. But after a decade of performing there, the friendship itself has become an illusion, with a complacent and egotistical Burt (Steve Carell) sick of Anton (Steve Buscemi) and content to recycle the same tricks so long as they help him bed his lovely (and quickly discarded) assistants and starstruck fans. But their prestidigitatious reign over the Strip is challenged when Steve Gray (Jim Carrey), a David Blaine-style performer whose act consists of grueling and macabre acts of masochistic endurance, begins stealing the pair’s audience. Burt is unwilling to adapt and after spectacularly sabotaging Anton’s efforts to enliven their routine, he finds himself in a downward career spiral. Director Don Scardino gives the film a lively look and has the good sense to allow a few illusions to play out in single shots onscreen. Alas, the screenwriters, like Burt, seemed content to coast. There are some clever bits of dialogue and cute situations but the characters are all thinly drawn, especially our dense protagonist. We never get a real sense of how the wide-eyed child we’re introduced to in the opening scenes becomes the self-centered jerk we’re saddled with and as a result, we’re never really invested in his inevitable redemption. Worse, every plot point feels familiar and half-hearted, right down to a perfunctory climactic competition between the rivals. The only thing of thematic substance to be found is a championing of the joy of performance, which is at least refreshing in its lack of cynicism. With the script so threadbare, it’s a relief to find there are actually a surprising number of laugh-out loud moments to be had and that the humor manages to find a happy balance between feeling edgy without being mean-spirited. Much of that success can be attributed has to the cast, who do what they can with the material. Lately Steve Carrell seems to have two comedic modes: the loveable sad sack and the tactless idiot persona he’s built a career with on The Office. Burt, so successful he’s grown clueless as to how real people live and interact, is little more than a slightly more pompous variation on the latter. Happily, Carrell still manages to make Burt’s professional meltdown entertaining, particularly during his drunken, pathetic efforts to perform without Anton or a tearful mea culpa that becomes a series of incomprehensible noises between sobs. Being as shallow as he is, Gray is probably the only character who benefits from the limitations of the script. With his cynical zeal to disgust his audience and his total lack of respect for the art or history of his profession, he encapsulates much of what’s wrong with modern entertainment and gives Carrey ample opportunity to remind us of his considerable skills at both physical comedy and crafting hilariously demented and unpleasant characters. While not quite at his best, it’s safe to say he hasn’t been this funny in years. The always great Steve Buscemi proves as good-natured as his character given how many cracks about his distinctive appearance the script contains. However, his absence for much of the second act leaves him underused. The lovely Olivia Wilde, stuck in the standard straight-woman/love interest role, seems to face similar problems as her character, an aspiring magician frustrated by her inability to break out and show what she can do. Still she pulls off what little is required of her with grace. Alan Arkin, looking like William Hartnell in his Doctor Who days, proves again how effortlessly he can make grumpy endearing. We also get appearances by James Gandolfini as a jovial casino owner and Jay Mohr who’s paradoxically amusing as a painfully unfunny comedy magician.